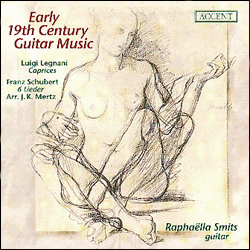 Raphaella plays Legnani and Schubert on a 7-string Mirecourt guitar. "My luthier Bernhard Kresse bought this instrument at an auction in Vichy, France, in 1995. The description was 'Romantic guitar, ebony neck, maple sound box. In its original box. Many blemishes.' Although the instrument was falling into pieces (it seemed that it had been stored for a long time in a place with high humidity), all the parts were in good condition and showed no damage or even traces of having being used. It is a typical guitar of the late 1820's with its classical shape and design, which we know from the guitar makers of Mirecourt, Paris. I asked Bernhard Kresse to add a seventh string: this modification was quite usual in the 1840's and 1850's, and recalls the music of Mertz and Coste." Luigi Legnani started to perform as a guitarist at the age of 19, but was as well a violin player and a singer at the Teatro Comunale of Ravenna directed by Rossini. He wrote these miniatures inspired by the Caprices of friend Nicolo Paganini. The differences of key, color and thematic material give each Caprice its own distinct character. The Romantic style of the Italian bel canto is never far away. Franz Schubert was above all the master of the Lied. He wrote his piano accompaniments simply, supporting the character of the text, with little agitation in the harmony or the rhythm. Thus he displayed his sympathy for the guitar, an instrument which he himself played. The transcriptions of the six Schubert-songs by Mertz, were done at request of the publishers Diabelli and Haslinger. The results are extremely fascinating and often compared with the arrangements for piano solo by Liszt in 1838. "That series of capriccio's should stand next to Chopin's preludes!" "The playing on this disk displays incredible virtuosity, phrasing, tone, and above all, a historically informed interpretation which fits the music." "What a fantastic record. Both the instrument and the music and of course your amazing playing make it an outstanding issue. The Legnani pieces in particular are a great discovery for me and for most people I would think." As Smits shows in her penetrating interpretations, the excitement in this 19th Century repertory does not reside in feats of technical daring, but in feats of musical daring ... I find the results exhilarating and perfectly in keeping with the romantic spirit." "The selection of Legnani's miniatures shows Smits' devotion and love for this music. With large feeling for details she knows how to build the internal tension in each part. In her interpretations of the Schubert songs Smits does not leave any desires open: she masters the multilayered song versions with her impeccable technique and an unusually strength of expression." "The solo guitar arrangements of six Schubert lieder are breathtakingly beautiful, and Smits brings an operatic intensity to Luigi Legnani's Capricci. This may be the finest available recording of music performed on an original 19th century guitar." "The Legnani pieces are short, sweet, and virtuosic. Smits, on her 7-string period Mirecourt instrument gives a sensitive performance without excessive ornamentation. The Mertz settings of Schubert lieder are lovely and expressive. This is an excellent collection of music by a musician who understands and loves it." "Outre le mérite de nous faire redécouvrir Luigi Legnani, souvent boudé par les guitaristes, ce CD nous montre une artiste en pleine possession de ses moyens et maîtrisant parfaitement son instrument. En un mot: de la belle guitare."